When they see him along the hiking trail, they stop dead in their tracks. They think he’s a black bear. LeRoy, the friendly Newfoundland, stands waist high to an average man and weighs 150 pounds. His muzzle looks like a St. Bernard, large and expressive. 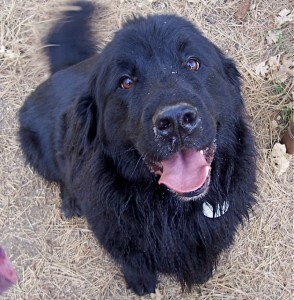 And with his long, black hair, well, he looks a little like a black bear. I scramble to put on his leash, and they usually look relieved. “I thought he was a bear,” they often exclaim. Locals know there’s no black bears in Idyllwild. They like certain berries, and there’s none up here for them. 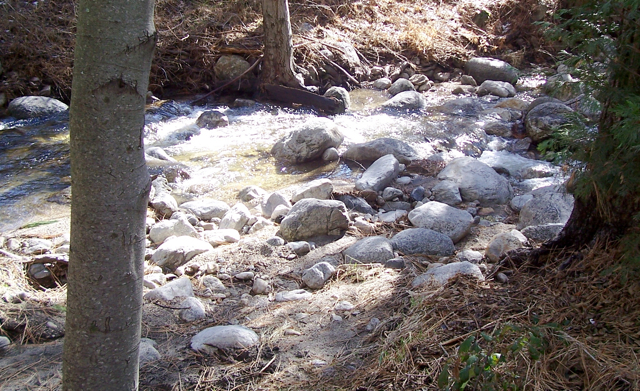 However, there used to be grizzlies in the San Jacinto Mountains many years ago, said David Roy, the chainsaw artist. You can find his impressive artwork along Hwy. 243 in Idyllwild or on www.mantlecarvers.com. If he’s around, he might tell you about the grizzlies. 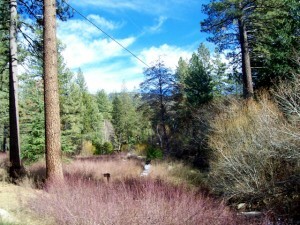 Because of this, LeRoy and I walk along secluded trails along Strawberry Creek. “Can I ride him?” one teenager asked, as we passed him. They can’t resist petting him. 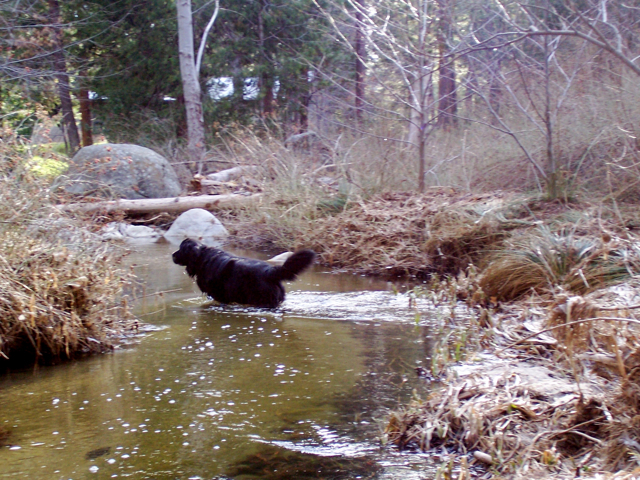 What I learned quickly about Newfoundlands is that you can’t keep them out of the water. Apparently, they were bred in Newfoundland to help bring in the fishing nets. LeRoy also loves to carry plastic bottles and sticks and especially his leash in his mouth. “Technically, he’s on his leash,” chides Mary, who owns him. 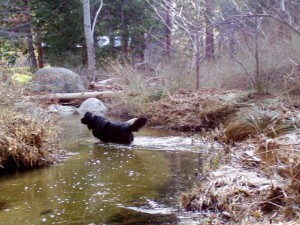 But then LeRoy likes to drop that leash into Strawberry Creek as he’s taking a drink or wading waist high to cool off. I go tumbling into the icy water after the leash. “Can’t afford to lose another one,” I scold him. Together we’ve lost three leashes and recovered only one. Strawberry Creek is not only a great cooling spot for LeRoy, but it’s beautiful sight to photograph. The creek changes from gushing waterfalls along large boulders, to small trickles meandering between low lying bushes. All along its bed are rocks of all sizes. Many times, their seemingly steady surface has failed me and I’ve fallen in. LeRoy likes to cross Strawberry Creek close to his home. In the beginning, I’d comply, grabbing a long stick to help maneuver my way. Invaribly, I’d lose my footing, and stumble forward into the water, trying not to get wet. Most times, I’d recover with just a wet shoe and pants leg, but once, I fell forward, shrieking loudly as I soaked my jacket, jeans and cell phone. The water was so cold, it had an instant numbing effect. And where was “man’s best friend” when all of this was happening? Calmly wading through the waters, showing no concern for my icy bath. Now, I walk across a bridge a little further down the creek. For all of his girth, LeRoy is surprisingly agile. He often takes off after birds and squirrels, but never catches them. “They had a head start,” he’d say with a turn of his head. Yet, I cannot thank him enough for flushing out an unusual bird the other day. It was a crane, and it took off seconds before LeRoy reached him. His long legs lagging behind him. I’ve never seen a crane close up, let alone one in mid-flight right before me. That one was the size of a dog, but he took off like a 747. Even after he disappeared behind some trees, my heart was still racing. But LeRoy was already lumbering along the trail, looking for more birds. What was a crane doing along Strawberry Creek? “They just stocked a bunch of trout,” explained a guy who was fishing along the creek close to the bridge. He was talking about the California Department of Fish and Wildlife. “I thought your dog was going to scare the fish away,” he said of LeRoy. His pole was meager, but he looked earnest in his attempts. “How big are the trout?” I asked. A little ways down the creek, we came across a beautiful mallard duck and his mate. They were swimming along a secluded part of the creek that was out of LeRoy’s reach. Like the crane and the fisherman, they were fishing for trout too. The didn’t try to fly away when they saw us. They seemed content just to cruise. 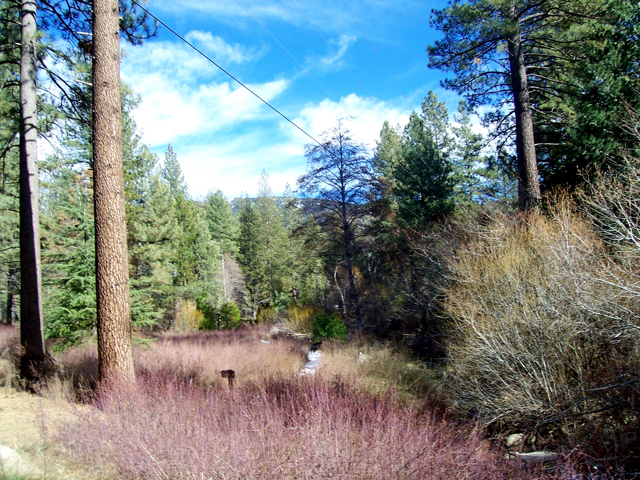 The trail took us away from Strawberry Creek and along a meadow that exposed a fantastic view of Tahquitz Peak. Many times, I’ve taken pictures of this scene, but its beauty never translates accurately onto film. In the near distance, we could hear an ambulance siren. LeRoy’s long floppy ears perk up momentarily. The siren lasts for only a few seconds, but then I heard dogs howling. Several of them were howling and yipping in unison, so they had to be coyotes. The ruckus was coming from the trees on the far side of the meadow. The coyotes were likely resting up for their night’s hunt, when that darn siren went off and woke them. LeRoy seemed oblivious to the siren and coyotes in the distance. Yet, I had to stop and think for a moment. What if they ever circled LeRoy? It wouldn’t be a fair fight. A happy-go-lucky Newfoundland and a middle-aged dog walker who believes in nonviolence. Without question, I’d fight for LeRoy like a mother bear protecting her cub. A friend of mine had a coyote encounter a couple of years ago. It was at night and her boyfriend was walking her female dog who was taking medication for a bladder infection. He heard a tiny “snap” of a twig, and turned around. A coyote the same size as her dog was trying to bite her hind quarters and take her down. “Anything is possible,” I said to myself, and kept looking behind us for any wayward coyotes. So, in a single afternoon along Strawberry Creek, LeRoy and I had come across a crane, a pair of ducks, a fisherman and a pack of sleeping coyotes.